Ontario is helping Northern Ontario entrepreneurs grow their companies and create more jobs across the North. Our government is investing $125,000 in YME Welding Enterprise Inc. through the province’s Northern Ontario Heritage Fund Corporation (NOHFC) Program. YME Welding – a newly-established welding/fabrication shop in Thunder Bay – specializes in industrial trailer repair for multi-sectors including forestry-based, mining, and road and highway maintenance industries. As well, YME caters to construction, commercial and residential housing with open-concept designed staircases, ornamental railings, fences, and gates. "By increasing the Northern Ontario Heritage Fund from $60 million to $100 million annually, we have an increased capacity to help northern businesses. Our focus since 2005 has been to use the fund to create private sector employment, and today’s announcement of $125,000 funding for YME Welding is an additional example of success in doing just that!" "We would like to take this opportunity to express our sincere thanks for choosing us as a partner with the Northern Ontario Heritage Funding Corporation. We appreciate your tremendous support in the fundamental establishment of our new company – YME Welding Enterprise Inc. We are very enthusiastic to have our project fulfilled with your funding assistance, to help us develop a business of great integrity in this Northern community; to encourage Northern entrepreneurial spirit; and most of all, to strengthen our Northern economy!" 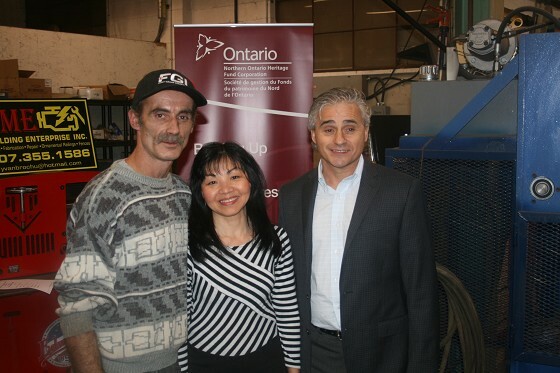 - Yvan Brochu & Tuyet Dao, YME Welding Enterprise Inc.
"I am delighted that, through the NOHFC, our government remains committed to partnering with businesses to drive growth and create good jobs here in the Northwest, and across Northern Ontario. I’m thrilled that we were able to support this local project." NOHFC programs focus on the growth of the existing and emerging sectors identified in the Growth Plan for Northern Ontario and the government’s key priority of helping communities prosper. The NOHFC offers five programs: the Strategic Economic Infrastructure Program, the Northern Community Capacity Building Program, the Northern Innovation Program, the Northern Business Opportunity Program and the Northern Ontario Internship Program. Yvon Brochu " This money to me means to help the north and create jobs and keep the younger people here to be taught right and do a nice job. The money will be used for equipment to make the jobs easier." " We do work on forestry chip vans, log trailers and floats for heavy equipment. We also do railings, fencing and a little of everything. We have been in business for 1 1/2 years but in the field for 27 years. Later on I plan on expanding and keep things rolling. We have three staff and my wife does the bookkeeping. The next generation are more into the computers and we need to give the young people jobs." Bill Mauro, MPP " It is really exciting working with quality people here. Work like this was being done in Thunder Bay for years by a major business that closed. Yvon is drawing in business from Kenora, Dryden and east of Thunder Bay so he is really growing something in our community. I am not suggesting welding is a new business here but a long time business closed and Yvon is doing some of this business with others as well. He is drawing in customers from as far as Kenora which speaks to the need, the quality of his work and he is ready to grow."